And here I cannot choose but give you that counsel that an old man in Naples gave me most wisely . . . frequent lectures, use disputations openly, neglect not your private studies, let not degrees be given for love, but for learning, not for money but for knowledge . . . . In 1564, Oxford and Rutland, along with a number of other dignitaries and noblemen, received Master of Arts degrees during the June commencement ceremonies at Cambridge University. Two years later most of the same group would get Masters degrees from Oxford University in a similar ceremony. Partly because Oxford and Rutland were 14 and 15 when they first received these degrees, the age when most students began their university training, and partly because there’s no evidence that they ever matriculated at either one, and partly because most of the degrees awarded at these two ceremonies were probably honorary, the question has been raised that the two Lord Edwards were given degrees due only to their rank, unsupported by any studies. At that time the awarding of college degrees was based, not on written exams, but on the word of the student’s tutor, sometimes the Headmaster, more often a teaching “Fellow.” As Chancellor of Cambridge University, William Cecil, in whose household the two were being educated, was certainly as highly qualified to judge their levels as any other member of the university system, having been trained himself over a six-year period by one of the most dynamic teams of educators ever known, one that included Oxford’s own tutor, and since Cecil felt that they were qualified for their degrees, we should accept his word. In fact it’s unlikely that after eight years with Sir Thomas Smith, de Vere would have needed any more education than he already had. The likelihood is that, by 14 Oxford was, as historian Jack Hexter put it when discussing the Reformation curiculum of boys like Oxford, “stuffed like a Strasbourg goose” with learning. What then was to be done with him? At 14 he was too young either for Gray’s Inn or a permanent place at Court. Idle hands being tools for the Devil, he must be studying––or at least doing––something. But what? Lacking hard facts, we need to posit some sort of scenario. Certainly Oxford himself would have wanted to go to the university. The most natural urge for a boy in his teens is to be among other boys his age, some slightly older and worthy of emulation, and with a choice of interesting instructors or coaches who have important knowledge or ideas. Such a setting would be particularly desirable for one who had learned most of what he knew from a single tutor, who never had much opportunity to spend time with boys his own age, and who was also, no doubt, eager to be out from under his guardian’s hypercritical eye. Oxford would crave to connect with boys his own age, not just intellectually but physically and emotionally. He would also be concerned that his college years might pass him by, leaving him forever without the experiences and memories that are every teenager’s right. As a child he was accepted by men older than himself as a child is always accepted, but as a teenager, and one with a full adult title, his rank, rather than a benefit, was a barrier to any sort of easy communication with his contemporaries. Even if he does go to the university, how is he to fit in? The problem for his guardian is more complex. While Cecil was all for the noblity getting educated at the universities, Oxford is a special case. As the Lord Chancellor of Cambridge University, it wouldn’t look good if his ward got into trouble, even worse if he got into trouble at Oxford where Cecil’s rival the Earl of Leicester was Chancellor. Given his education and his intelligence, he might embarrass the other boys with his learning, possibly even his tutors as well. There’s the question of religious contamination: the universities were hotbeds of sedition, radical puritan as well as Catholic, a situation that as Chancellor it was Cecil’s duty to control. There’s also the question of actual physical danger: the universities were rowdy, student violence was a constant threat. As a group, they have no love for the “bloody toffs” and delight in chasing them off what they see as their turf with volleys of rocks. Yet, what else is to be done with him? It’s a question that will haunt Oxford his entire life and that has a great deal to do with the secretive route he will eventually take. The times were changing. The traditional roles of the great magnates were not just changing, they were disappearing. He’d been trained by Reformation scholars, given what may have been the finest liberal education since the days of Plato and Aristotle, ostensibly to make him fit to take his place as a leader of his nation––but what place is that? Future peers will retreat to a lesser but still important role in their local jurisdictions. Or they will simply adapt to the demands of the brave new world of commercial enterprise, acquiring through trade and manufacturing what they can no longer get through monopolies or land. Oxford’s forebears had plunged early into military careers, following their fathers, brothers, and uncles into battle as soon as they could swing a broadsword. But the world had changed. To his cautious monarch and her even more cautious Secretary of State, Oxford was too young at 13 and too important to be allowed to follow his friends to the battle for Newhaven (Le Havre, May 1563). Which was just as well for posterity, since, as would happen later with Philip Sidney, he might never have returned. With so few facts at our disposal, we should look to Cecil’s pattern with his other noble wards, which was was to begin with a tutor at one of the university colleges and finish with some time at Gray’s Inn. This was how he handled the situation with them, but with his first two, Oxford and Rutland, although there’s evidence of tutoring at Cecil House in dancing, horsemanship, French, and Anglo Saxon and later of registration at least at Gray’s Inn, there’s no indication (as yet) that, as teenagers, either of them spent more than a few days at one of the university colleges. But this cannot be taken as proof that they didn’t. As was true of so many of their class at that time, they could easily have rented rooms at one of the halls or colleges nearby, attended lectures along with the other students, and participated in the life of the university without ever matriculating or leaving any sort of record of their presence. Hexter notes that “English university registers of the sixteenth century were less likely to mark the presence of the wellborn than of the baseborn. . . . An undeterminable number of gentle-born did not bother to matriculate in Oxford at all, although they had lodgings in a college” (54). Historians are inclined to repeat that Cecil invariably sent his wards to his own colleges, St. John’s Cambridge and Gray’s Inn, but the evidence suggests that it was less a particular college that inspired his choices than the character of the master who would be looking after them. In the case of Robert Devereux, the young Earl of Essex, it was John Whitgift at Trinity College Cambridge. By the time Henry Wriothesley, third Earl of Southampton, required a college it was William Whitaker of St. John’s, also at Cambridge. Both Whitgift and Whitaker were confirmed Protestants of the strictest Calvinist sort. In seeking where Oxford would have been placed, we must locate a master or tutor who would appeal to Cecil. Admitting that this is only a clue to what requires a great deal more research, one such could have been Thomas Bernard, Canon of Christ Church College at Oxford, the more prestigious of the two colleges at Oxford that were firmly Protestant. Both Cecil and Smith would have been familiar with Bernard from their days at Somerset’s Court where he functioned as Cranmer’s chaplain. By the 1560s, having been Canon at Christ Church (off and on) for almost two decades, Bernard’s age and seniority would have recommended him to Cecil as would the fact that his views on religion were firmly based in Geneva. Even without these tempting clues, in seeking the most likely college for the teenage Oxford, Christ Church would seem the most natural choice for someone of his rank and background, particularly if, as I believe, he was already writing and producing plays to entertain the Court community. The largest and wealthiest college at Oxford, it was also the one most likely to be attended by young aristocrats. 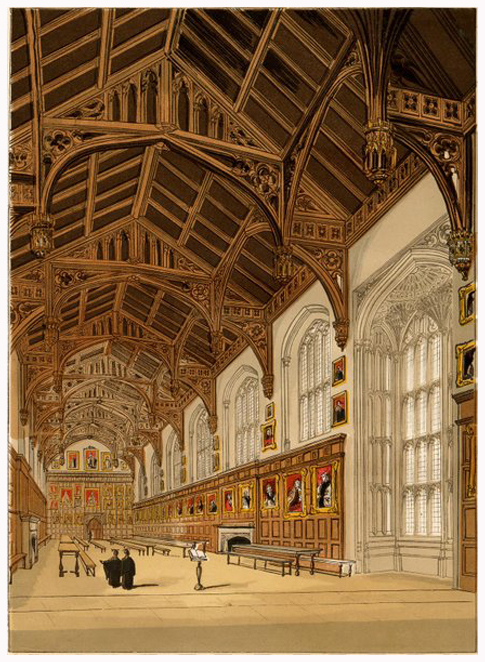 With elegant new buildings created by Cardinal Wolsey out of dissolved monasteries, Christ Church had the biggest and most beautiful dining hall on campus, the one that was invariably used to entertain visiting dignitaries. Who’s who at Oxford University in 1564 – 1567? Richard Verstegan (aka Richard Rowlands or Rowlaunde) began his career as polemicist in 1581 by publishing a Catholic polemic on the execution of Edmund Campion. This forced him to flee to the Continent from whence he continued to smuggle back into England graphic accounts of the sufferings of English Catholics, illustrated with high quality engravings. Alison Shell calls him “the English Counter-Reformation’s most tireless publicist” and a major figure in the “prehistory of the English newspaper” (15). It can hardly be doubted that Verstegan­­––whose Dutch artisan father was probably a Protestant––had been converted, as were so many students at Oxford at that time, through contact with the charismatic Catholic martyr. Had the truth about Campion’s beliefs been more widely known at the time, it’s unlikely that Cecil would have considered sending de Vere to Oxford (if he did), but in the mid-’60s Campion was still considered a shining light of the Protestant faction. Campion’s crisis of conscience would not send him from the university until 1569. Oxford’s other (possible) housemate at Oxford, George Pettie, is known as the author of Pettie’s Petite Pallace, an early book of romance tales, published in 1576. Pettie’s Pallace is written in a flowery style so similar to that used in the ground-breaking novel, Euphues, the Anatomy of Wit, published three years later as the work of Oxford’s then secretary, John Lyly, that one would think they were written by the same author. Lyly also attended Oxford, though apparently not until 1569 when his future employer would no longer have been at the college––though it must be noted that students often attended for several years before matriculating. Lyly’s style has been attributed to the influence of Dr. John Rainolds, who, during Lyly’s time at the university (1569-75), was popular for his lectures on Aristotle’s theories of rhetoric, and who in James’s reign would lead the team that created the King James Version of the Bible. The euphuism of Stephen Gosson’s late ’70s diatribes against the public stage is also attributed to Rainolds, Gosson having attended Magdalen College Oxford (1572-76) along with Lyly. But Rainolds cannot be credited with Pettie’s euphuism, since Rainolds, a mere undergraduate at Corpus Christi during the period that Pettie was studying under Bernard, was Pettie’s junior by a year. It would not be until 1572 that Rainolds achieved university stardom as Greek Orator, and began his series of lectures on Aristotle, by which time Pettie, who graduated in 1569, was already gone. It seems more likely that all four, Pettie, Rainolds, Lyly, and Gosson, were exposed to euphuism through other means. If de Vere did spend time at Oxford during this period, like Verstegan he could not help but be influenced by Edmund Campion, then in his twenties and a teaching Fellow at St. John’s. Contact with Campion, whose charisma and intellect were such that he was already being considered as a future Archbishop of Canterbury, would go farther to explain de Vere’s early attraction to Catholicism than his later adventures in Italy. It would also help to explain why Burghley and the Queen were so hesitant to let him go. Another young peer studying at Oxford at that time was Gilbert Talbot, two years Oxford’s junior, who eventually succeeded his father as the seventh Earl of Shrewsbury. It is through Gilbert’s correspondence with his cousin, the Earl of Rutland, that what personal items remain describing Oxford during his early years at Court. Just as Campion, Verstegan, and Pettie were finishing their studies at Oxford, the university began seeing an influx of students who in time to come would have a major impact on English literature, many of them enrolled at Christ’s Church. In addition to Lyly and Gosson, there was George Peele (1556-96) who went up to the university from London at fourteen, residing first at Broadgates Hall, then crossing the road to Christ’s Church in 1574, a frequent path for men of intellect but lesser rank. There was William Gager (1555-1622), a brilliant poet and playwright who’s been lost to English literary history because of his concentration on Latin. A student at Christ Church from 1574, Gager remained until 1589, taking his BCL and DCL (ODNB). There was the poet Philip Sidney (1554-85) who entered the college in 1568, probably missing Oxford by at least a year. Shortly before (or after?) he would be affianced briefly to Oxford’s future wife, Anne Cecil. Also at Christ Church at that time was the future historian, William Camden (1551-1623). Many of these were present for the elaborate commencement exercises that took place before the Queen and all the Court in September 1566 when Oxford and Rutland received their second Master of Arts degrees, and where orations by Campion were featured throughout. One of the major events was the play, Palamon and Arcite, performed by Oxford students (among them John Rainolds and Toby Matthew, future Archbishop of York). Attributed to Richard Edwards, Master of the Children of the Queen’s Chapell, who was producing most of the Court entertainment at that time, the play was performed in the great hall at Christ Church on two succeeding nights. Based on Chaucer’s The Knight’s Tale, Palamon and Arcite was later reworked by Shakespeare into Two Noble Kinsmen. If Oxford was the true author of Palamon and Arcite, as suggested by Oxfordian Katherine Chiljan and others, and was also the author of the earlier play attributed to Edwards, Damon and Pythias, performed at Court and at Lincoln’s Inn two years earlier during the winter holidays of 1564-5, an association of seemingly unrelated facts can be gathered into a compelling unit. In Edwards’s only other published work, the anthology (published posthumously in 1576) titled The Paradise of Dainty Devices, 13 poems attributed to him include a dirge, “When griping griefs the heart doth wound,” that many years later Shakespeare will have Capulet’s musicians sing in Romeo and Juliet (4.5). Although there’s no evidence that Damon and Pythias was one of the plays performed earlier that year at the June commencement exercises at Cambridge where Oxford and Rutland got their Masters degrees, several things suggest a connection beyond the mere fact that both are attributed to Edwards. They follow each other in time, the better following the weaker, both exploring the same theme, the nature of a devoted male friendship. Also, a comment made by a member of the audience following Palamon and Arcite suggests that, of all the plays produced during that period, these were the two that got compared: “a party of courtiers who had seen a rehearsal of it said it far surpassed Damon and Pithias than which they thought nothing could be better.” In any case, the idea that Edwards may have been one of Oxford’s first fronts seems worth pursuing. Were Oxford and Rutland Palamon and Arcite? Hitcham is in the upper left corner, Windsor lower right. Like Oxford’s father the year before, the 2nd Earl of Rutland died the summer of 1563, and also like Oxford, the new Earl of Rutland, Edward Manners, probably joined the Cecil household right away, though probably not at Cecil House in London, due to the plague that was raging that summer. 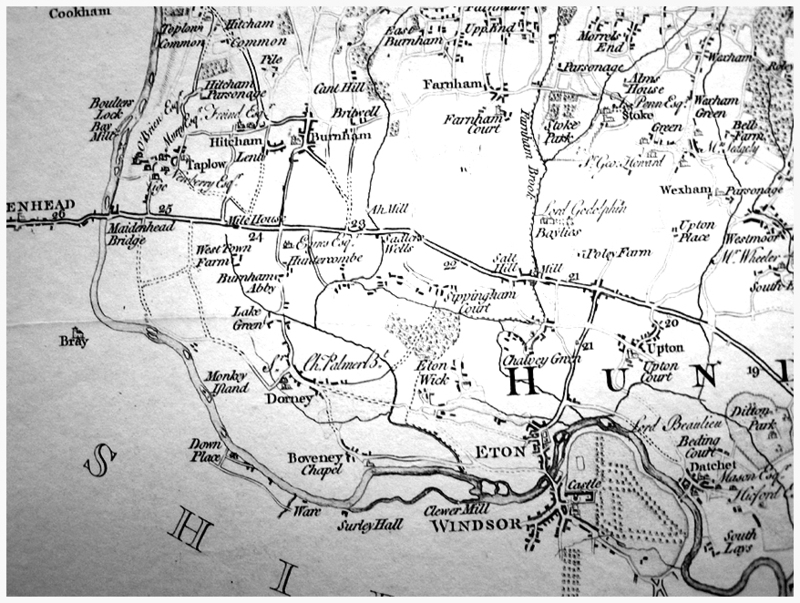 We know from a letter from Cecil written January 9, 1564, to the Countess of Rutland, that her stepson was to join Oxford shortly at “Hitcham near Burnham” (Altrocchi). Located just north of Windsor Castle, a likely location for the Court holiday festivities that year, this may be where Oxford spent the winter holidays of 1563-64. If we’re correct, and the many fictional male friendships borrowed from the classics that may (or may not) be among Oxford’s early creations––Damon and Pythias, Palamon and Arcite, Proteus and Valentine, Romeo and Benvolio, Hamlet and Horatio––are any indication, the young playwright, following what must have been a rather lonely childhood, formed an intense and lasting affection for this surrogate brother and namesake, the son of his father’s close friend, a man whose conservative nature, so far as we can judge it, provided a perfect counterbalance to Oxford’s passionate nature. That these “buddy plays” were written with Rutland in mind is a logical guess. Truly, my Lord, my good will serves me to have moved such a matter as this in another direction than this is, but having more occasion to doubt of the issue of the matter, I did forbear. And in mine own conceit I could have as well liked there as in any other place in England. Percase your Lordship may guess where I mean, and so shall I, for I will name nobody. (Read Burghley 127). Since Rutland’s name (or any proxy name) is not included as having studied with Bernard at that time, it’s likely that Cecil separated them, perhaps sending Rutland to study at Cambridge. Whether or not Cecil feared the possibility of sexual hanky panky (a general fear at that time with regard to boys, as many Reformation texts testify, one that would have been amplified by memories of Oxford’s father’s misbehavior), his jealousy of Oxford’s affection could have prompted him to frustrate Oxford’s affections whenever he could. Thus, as he would do later when separated from Ann Vavasor, Oxford filled the void by writing a play. Further evidence that Oxford must have attended one or both universities is the proto-novel Euphues, the Anatomy of Wit. Published two years after his return from Italy, it’s obvious to anyone who knows his biography that it’s based on his travels. There’s no way of knowing whether there was a genuine love triangle between himself, one of his companions, and a passionate girl whom he calls Lucilla in the book, or perhaps that a similar situation in England was relocated to Italy, but what seems certain is that both Italy and the love triangle derived from experience. Literary history has focused less on the story (an early version of so many that will soon be published as by Robert Greene) and more on its style, which came to be known as euphuism, traces of which can be found in Oxford’s early work, through, so we’re told, it was spread to a number of writers who, while at Oxford, heard the lectures of Richard Rainolds. Attributed to Oxford’s secretary at the time, John Lyly, the entire work can be seen as Oxford’s response to the pedagogues whose systems were imposed on him during his learning years, chiefly The Scholemaster by Roger Ascham. Begun in 1563, the year Oxford was first studying with Cecil, it’s dedicated to Cecil, with an introduction that makes it clear that the book was written in response to Cecil’s questions about the education of young gentlemen. Although centuries of scholars have attributed the thoughts and opinions towards the university to Lyly, who studied there later, they don’t fit his biography nearly as well as they fit Oxford’s, both in general and in a number of particulars. 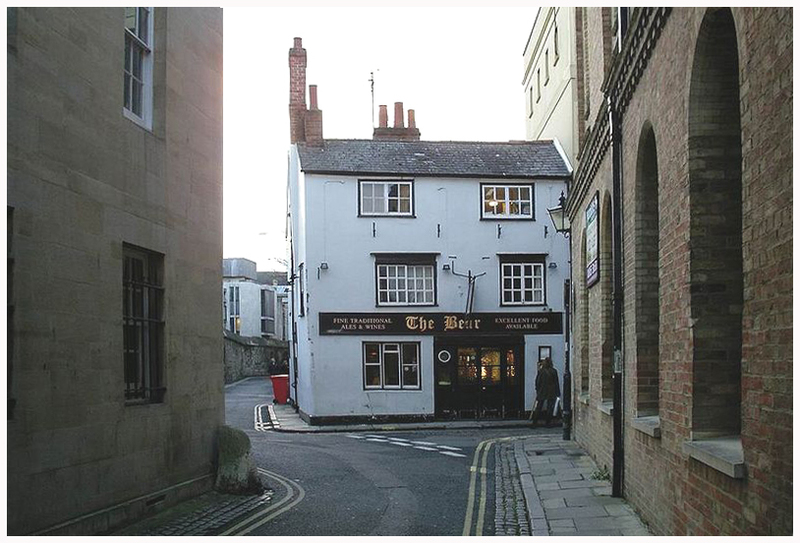 The Bear Inn on Blue Boar Street near the location of the original Blue Boar Inn. It may be of interest that Christ Church occupies land that abuts on Blue Boar Street, a “narrow, high-walled” little street that runs next to the north side of the college. Originally named Tresham Lane in 1532 following the building of the college, it was renamed at some point during Mary’s reign for the old Blue Boar Inn that then occupied its northeast corner. As the Blue Boar was the centuries old cognizance of the Oxford earls, there can be no doubt that the inn had some connection to Oxford’s family, perhaps through what had been the former monastery of St. Frideswide, torn down to make way for Wolsey to build what later became known as Christ Church College. Today, land next to the street is occupied by the Blue Boar Quadrangle, the site of a modern dorm built in an L shape to accomodate the college’s old “brewhouse,” which quite likely originally belonged to the inn. It is unlikely however that this has any connection with de Vere’s possible residence in the vicinity in the mid-1560s, for, according to Anthony á Wood, the inn belonged to Magdalen College at that time (Antiquities of Oxford, 617). There were Blue Boar inns, streets, and courts all over England, including a Blue Boar Court at Trinity College, Cambridge. Is the griping griefs coincidence a new discovery? I don’t recall hearing about it before. I see that Charles Wisner-Barrell has this covered. I found it in the ODNB biography of Edwards.